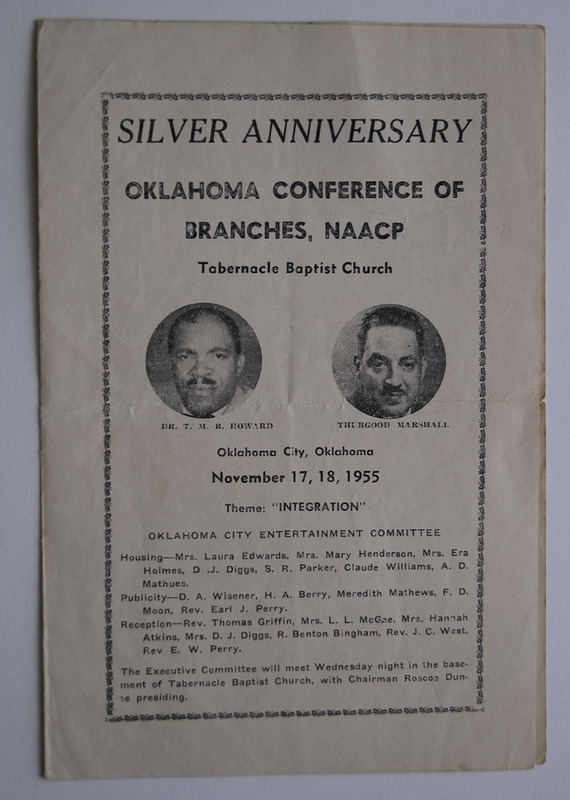 This program was handed-out at the silver anniversary Oklahoma Conference of Branches, NAACP on November 17 and 18th 1955. The legendary T.M.R. 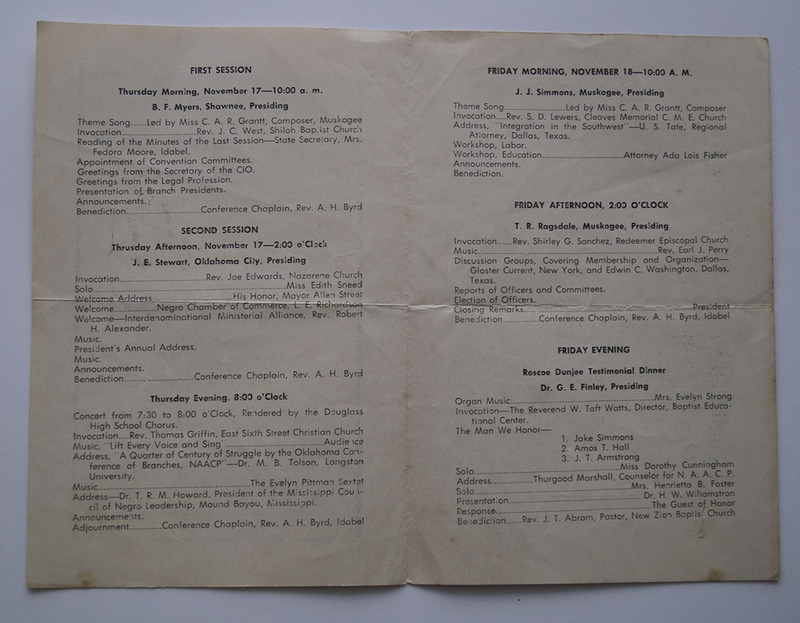 Howard and Thurgood Marshall were the featured speakers. The theme was “INTEGRATION”. Visitors noticed the high level of security, including armed guards and a plethora of weapons. Historians David T. Beito and Linda Royster Beito have written that Howard’s residence “was so impregnable that journalists and politicians from a later era might have used the word ‘compound’ rather than ‘home’ to describe it.” Howard evaded Mississippi’s discriminatory gun control laws by hiding a pistol in a secret compartment of his car, and “slept with a Thompson submachine gun at the foot of his bed.” He brought Emmett’s mother Mamie Till Bradley in from Chicago at his own expense, and she stayed at his home when she came to testify. Howard “escorted [Bradley] and various others to and from the courthouse in a heavily-armed caravan.” Like many black journalists and political leaders, Howard alleged that more than two people took part in the crime. 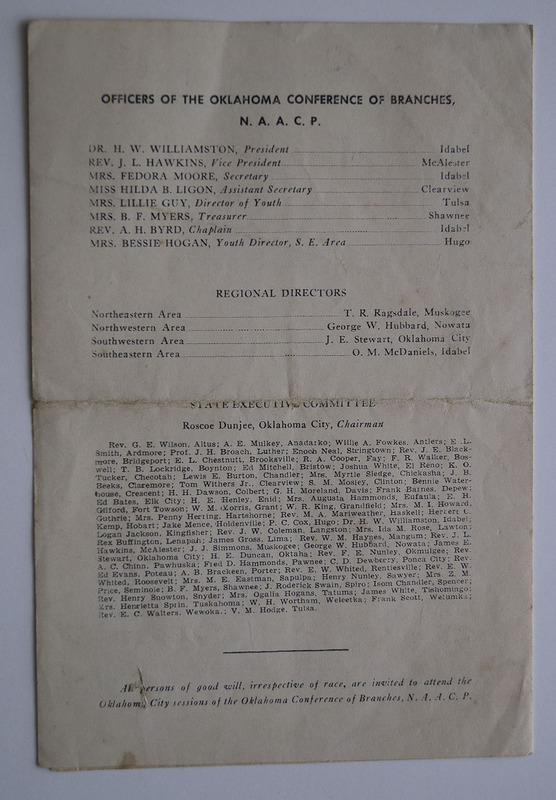 After an all-white jury acquitted Milam and Bryant, Howard gave dozens of speeches around the country on the Till killing and other violence in Mississippi, typically to crowds of several thousand. One of them was to an overflow crowd on November 27 in Montgomery, Alabama, at the Dexter Avenue Baptist Church. His host for the event was Martin Luther King Jr. and Rosa Parks was in the audience. Many years later, she singled out Howard’s appearance as the “first mass meeting that we had in Montgomery” following Till’s death. Only four days after his speech, Parks made history by refusing to give her seat on a city bus to a white man in violation of a segregation ordinance. Howard’s speaking tour culminated in a rally for twenty thousand at Madison Square Garden, where he was the featured speaker. He shared the stage with Adam Clayton Powell, Jr., A. Philip Randolph, Eleanor Roosevelt and Autherine Lucy. In the final months of 1955, Howard and his family were increasingly subjected to death threats and economic pressure. He sold most of his property and moved permanently to Chicago. His national reputation as a civil rights leader still seemed secure. He also had a highly visible public dispute with J. Edgar Hoover, whom he accused of slowness to find the killers of blacks in the South. In early 1956, the Chicago Defender gave Howard the top spot on its annual national honor roll. He founded the Howard Medical Center on the South Side and served for one year as president of the National Medical Association, the black counterpart of the AMA. Howard also became medical director of S.B. Fuller Products Company. Samuel B. Fuller was probably the wealthiest black man in the country at the time.